This article walks through creating and debugging a simple Reliable Actor application in Visual Studio. For more information on Reliable Actors, see Introduction to Service Fabric Reliable Actors. 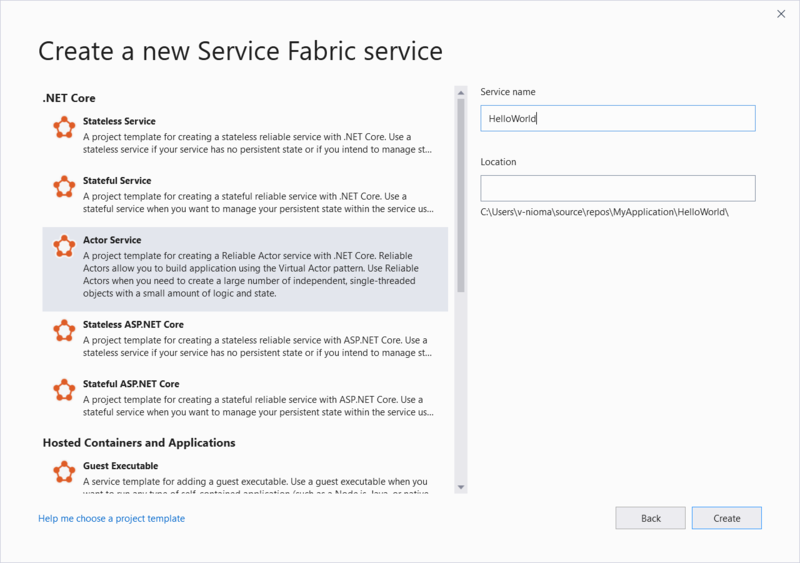 Before you start, ensure that you have the Service Fabric development environment, including Visual Studio, set up on your machine. For details, see how to set up the development environment. In the next dialog box, choose Actor Service under .NET Core 2.0 and enter a name for the service. The application project (MyApplication). This project packages all of the services together for deployment. It contains the ApplicationManifest.xml and PowerShell scripts for managing the application. The interface project (HelloWorld.Interfaces). This project contains the interface definition for the actor. Actor interfaces can be defined in any project with any name. The interface defines the actor contract that is shared by the actor implementation and the clients calling the actor. Because client projects may depend on it, it typically makes sense to define it in an assembly that is separate from the actor implementation. The actor service project (HelloWorld). This project defines the Service Fabric service that is going to host the actor. It contains the implementation of the actor, HelloWorld.cs. An actor implementation is a class that derives from the base type Actor and implements the interfaces defined in the MyActor.Interfaces project. An actor class must also implement a constructor that accepts an ActorService instance and an ActorId and passes them to the base Actor class. This project also contains Program.cs, which registers actor classes with the Service Fabric runtime using ActorRuntime.RegisterActorAsync<T>(). The HelloWorld class is already registered. Any additional actor implementations added to the project must also be registered in the Main() method. The project template defines some methods in the IHelloWorld interface and implements them in the HelloWorld actor implementation. 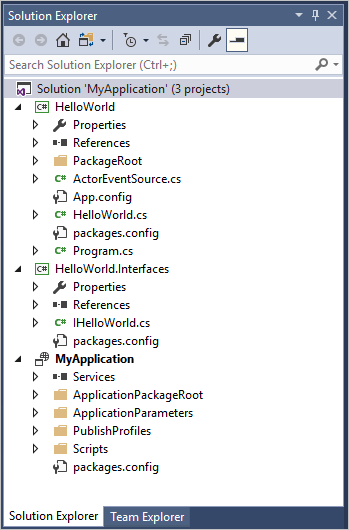 Replace those methods so the actor service returns a simple "Hello World" string. Press Ctrl-Shift-B to build the project and make sure everything compiles. Create a simple console application to call the actor service. 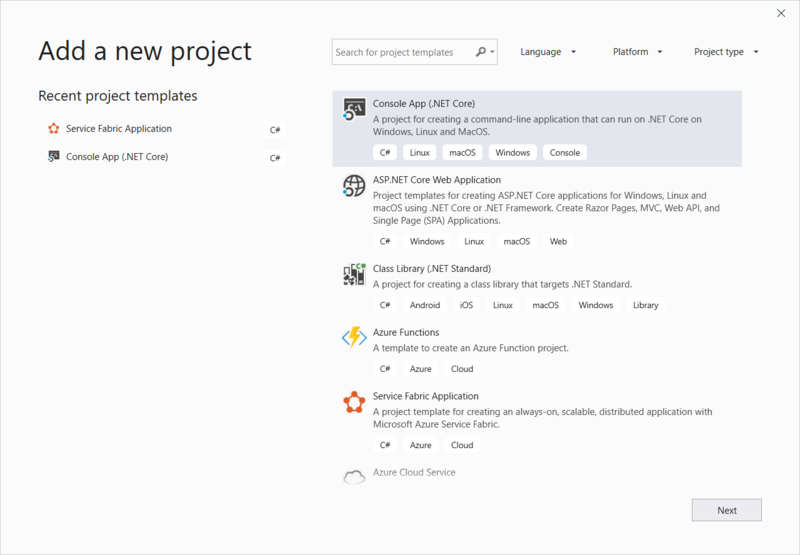 Under the .NET Core project types, choose Console App (.NET Core). Name the project ActorClient. A console application is not the type of app you would typically use as a client in Service Fabric, but it makes a convenient example for debugging and testing using the local Service Fabric cluster. The console application must be a 64-bit application to maintain compatibility with the interface project and other dependencies. In Solution Explorer, right-click the ActorClient project, and then click Properties. On the Build tab, set Platform target to x64. 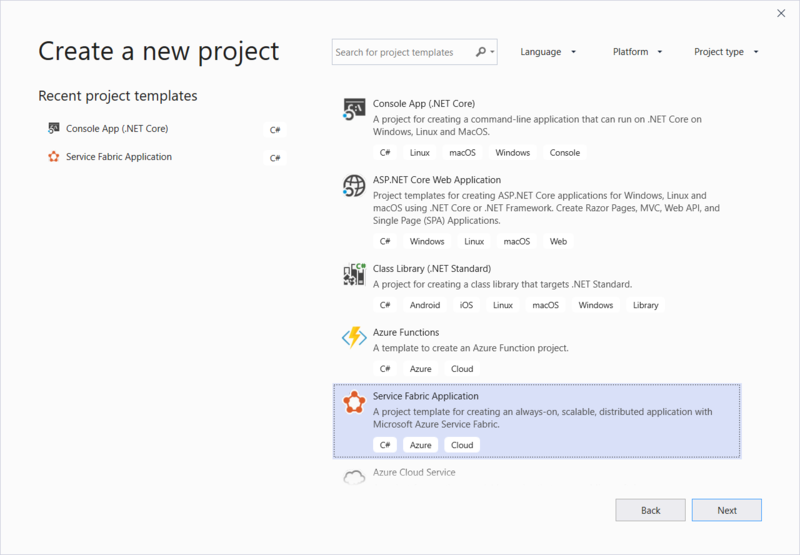 The NuGet package and all its dependencies are installed in the ActorClient project. The client project also requires a reference to the interfaces project. In the ActorClient project, right-click Dependencies and then click Add reference.... Select Projects > Solution (if not already selected), and then tick the checkbox next to HelloWorld.Interfaces. Click OK.
Press F5 to build, deploy, and run the application locally in the Service Fabric development cluster. During the deployment process, you can see the progress in the Output window. When the output contains the text, The application is ready, it's possible to test the service using the ActorClient application. In Solution Explorer, right-click on the ActorClient project, then click Debug > Start new instance. The command line application should display the output from the actor service. The Service Fabric Actors runtime emits some events and performance counters related to actor methods. They are useful in diagnostics and performance monitoring. Learn more about how Reliable Actors use the Service Fabric platform.